After a productive weekend, Seuly Matias delivered again Monday. Kansas City's sixth-ranked prospect homered in his third straight game, belting his fourth jack since Saturday in Class A Advanced Wilmington's 9-8 loss to Winston-Salem at BB&T Ballpark. Matias wasted no time continuing his streak. Facing Dash right-hander Zach Lewis with the bases empty and two outs in the top of the first inning, he smacked a line drive over the wall in right-center field. It was his lone hit in four at-bats, but Matias plated another run in the fifth, when he was hit by a pitch with the bases loaded. 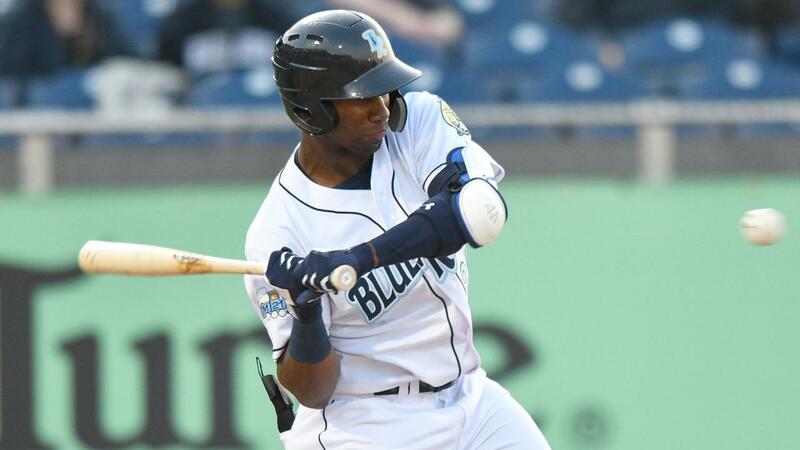 The 6-foot-3 native of the Dominican Republic went 1-for-3 in the opener of Wilmington's Saturday doubleheader at Carolina and began his torrid run in the nightcap. He collected his first homer of the year -- a two-run dinger -- and tripled to finish 2-for-3 with two runs scored. On Sunday, Matias went yard in consecutive at-bats, taking Mudcats right-hander Christian Taugner deep in the fourth and sixth innings. With Class A Lexington last year, Matias batted .231 in his first full season, but clubbed 31 homers, second most in the South Atlantic League. This came after he hit seven long balls in 57 games for Rookie Advanced Burlington in 2017. Kyle Isbel, Kansas City's 10th-ranked prospect, also homered Monday. Fourth-ranked White Sox prospect and No. 38 overall prospect Luis Robert went 2-for-4 with an RBI, a run scored and a stolen base while No. 45 overall prospect Nick Madrigal went 3-for-4 and also crossed the dish for the Dash.